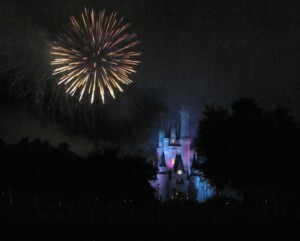 Walt Disney World's Summer Nighttastic Fireworks Show at Magic Kingdom is spellbinding (© 2010 Karen Rubin/news-photos-features.com). I admit it: I was as thrilled as any six-year old to see the bursts of fireworks over the magical Cinderella Castle at Magic Kingdom. Summer Nightastic! Fireworks Show, on through August 14, is truly one of the phenomenal spectacles that only Disney Imagineers could pull off (when the bursts formed the pirate skulls, that was jaw-dropping amazing). We very cleverly checked the schedule of activities in order to make the best use of our two days of Park Hopper tickets, spent our first day at Hollywood Studios (it was open until 8 p.m. that night, then we were too tired to go to another park); then spent our second, amazing day at Animal Kingdom knowing that Magic Kingdom was open until 11 pm., with the Electric Parade on at 9 and 11 pm. and the fireworks at 10 pm. We took the ferry over from the parking lot (instead of the Monorail), for an exquisite view of Magic Kingdom, and arrived just as the Main Street Electrical Parade was getting underway, miraculously managing to get a spot right on Main Street. 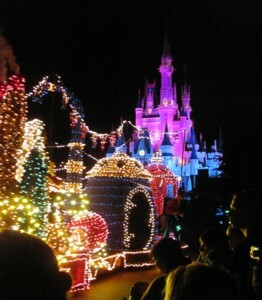 And then to have Magic Kingdom almost to yourself at night, in the dark, to do the rides and attractions! We got to do the Big Thunder Mountain Railroad (my favorite coaster), then dashed to Tomorrowland (it makes you smile to see a 1950s “vision” of the future) to Space Mountain coaster, getting in the last ride of the night. 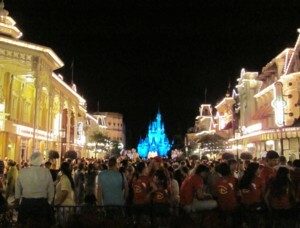 Coming back, the 11 p.m. Electrical Parade was underway and we got to see the end from a different perspective, right in front of Cinderella’s castle. Magic Kingdom’s Main Street Electric Parade comes to Cinderella’s Castle making a spectacular sight (© 2010 Karen Rubin/news-photos-features.com). At Epcot’s nighttime display, the skies explode with lasers, fireworks and music for the IllumiNations: Reflections of Earth that glitters and glows over the World Showcase Lagoon. There’s no question, Disney’s got it.. The Magic. You can’t even put your finger on it. As an adult, you appreciate the artistry, the creativity, the imagination, and then simply get lost in a child’s delight. You are swept up in the enchantment, taken to other worlds, no matter how old you are or where you are in your life, or where you are from. In fact, walking with the crowd as Animal Kingdom was closing for the night, you sense that there is no place on earth that has such a conglomeration of humanity. As it happens, it was around the Tree of Life, but we felt it again on Main Street in the Magic Kingdom. For the time you are under Disney’s spell, it almost seems that there is nothing else beyond these magical worlds. Hollywood Studios (the Extreme Stunt show is not to be believed; the Rock ‘n’ Roller Coaster Starring Aerosmith is a music-charged zoomfest that takes you through loops, twists and turns inside; a new addition is the American Idol Experience); Animal Kingdom (Expedition Everest is an amazing coaster set in a realistic re-creation of Nepal; Harambe safari is stunningly realistic; we had an amazing trek of our own seeking the silverback gorillas on the Pangani Forest Exploration Trails, the daytime Mickey’s Jammin’ Jungle Parade is wildly creative, and the new “Finding Nemo” Broadway-style musical is Tony-Award caliber that will delight everyone; and “Tough to be a Bug” 3-D experience in the base of The Tree of Life is as marvelous as ever); and Magic Kingdom. Planning tips: Wednesday is the least crowded day at the theme parks. Check the Walt Disney World website to get a schedule for the parks – which are open late, when the parades and the fireworks are scheduled, or special events. I suggest, if possible and the schedule works out, save your favorite park for the second day in order to get the full enjoyment: you are tired after traveling and it takes a day to get oriented to the Disney way the parks operate. Take advantage of Disney’s FastPass system – where you can get a time to return (it spans an hour) and you just breeze in, so you don’t have to wait on the standby line. You can only use the pass once an hour, though. See our full story at http://www.travelwritersmagazine.com/TravelFeaturesSyndicate. This entry was posted on July 24, 2010 at 5:10 pm and is filed under family travel, Florida, themeparks, Walt Disney World. You can follow any responses to this entry through the RSS 2.0 feed. You can leave a response, or trackback from your own site.